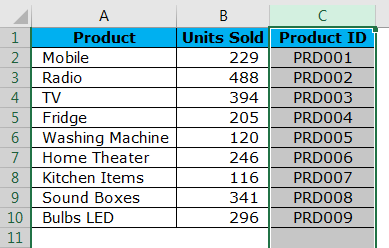 Move Columns in Excel (Examples) | How to move columns? When we work with large data set in excel we may often require to move our column from one place to another to arrange the data in order. Moving could be from left to right or from right to left. We have seen adjusting column width and rows height to show the data intact in Excel. Usually, we move unwanted columns to the end of the data range or we always keep closely related columns together, in these cases we need to move our existing column to swap, interchange or play around with those columns to finally make the data structure well in place. In Excel, we don’t have a straight forward button which performs the task for us. We need to apply our own logic to move columns from one place to another. In this article, we completely concentrate on the techniques of moving columns in Excel. We are all familiar with dragging formulas from one cell to many cells in Excel. Similarly, we can change the column position by the method of drag and drop. However, it is easier than done because of the complexity involved in it. You need some work experience to completely master this otherwise, you will face a situation of possible data loss. 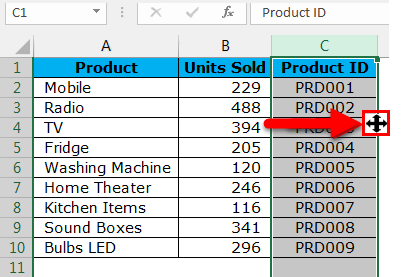 Assume you have Product List, Sold Units, and Product ID data in your spreadsheet. If you closely look at the data we need to look at the familiar data structure for a better understanding of the data. In a general case scenario, an ideal data structure is Product Name, Product ID, and Units Sold column. But here, our data structure is slightly interchanged, the Product ID is there at the right end of the data structure. 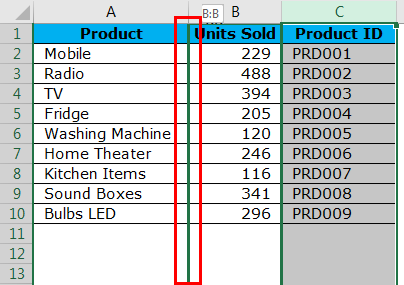 So we need to move Product ID column to the left side of the Units Sold column. Follow the below steps to arrange the data in order. Step 1: Select the entire column of Product ID. Step 2: Place the mouse pointer to the left side of the selected column. You need to see the change of the mouse pointer symbol from regular PLUS symbol to 4 sided navigation arrow type symbol. Step 3: Hold SHIFT Key and the 4 sided arrow key with the left button of your mouse to drag the selected column to the location where you wish to place. 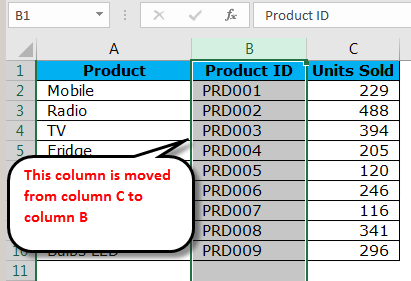 In this case, I want to place this column after PRODUCT column. When you try to drag you can notice the green colored straight line as shown in the below image. Step 4: Green line is the indication that if you release your holding keys (Shift + Mouse Pointer) the selected column will be placed here. So you can drag the column until you find this green colored straight line next to the column you wish to move. Your newly moved column is in place now. The key here is, where you need to release the holding mouse key. Looks an easy task but needs some working practical knowledge to get familiar with it. 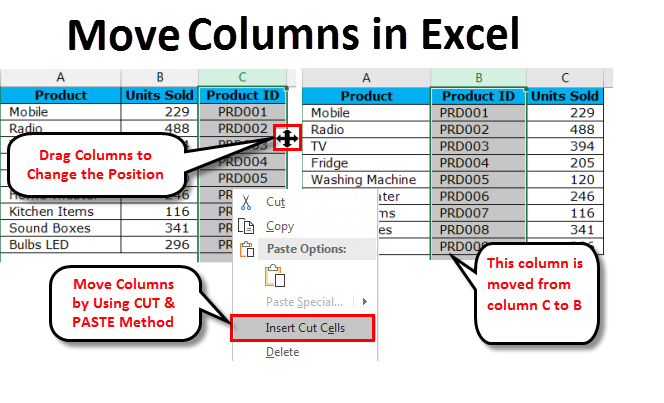 We’ve seen how to move columns in Excel easier but easier said than done. This is much simpler than the previous one i.e. cut & paste method. Take the same data from the previous example. Step 2: After selecting the desired column CUT this column by using the familiar shortcut key CTRL + X. Or else you can right click on the column select CUT. Step 3: Now you need to select the column which needs to come after the pasting column i.e. 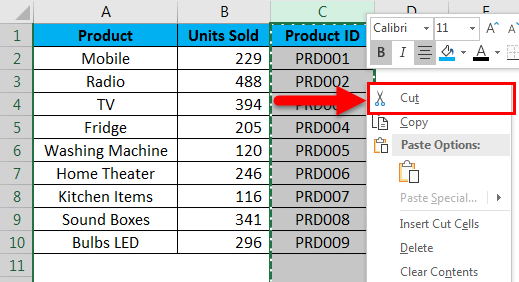 If you wish you move column C to B you need to select the column B after you cut the column C.
Step 4: Now right click on the selected column and select Insert Cut Cells. 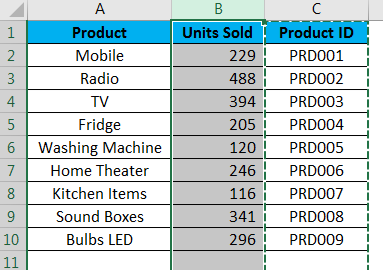 Step 5: As soon as you select the option Insert Cut Cells it will insert the column C to Column B and current column B will be moved to column C.
This is probably the most difficult way of moving columns in Excel and probably you will hate me for showing this to you. The only reason I am showing this to you because as a learner it is always a good thing to know as much as possible, you never know when they come handy to you. Take a look at the below table everything seems ok but there is only one problem that all the months are not in order. Apr, May should come after Feb, Mar month. Follow the below steps to rearrange this in order. Step 1: Insert two columns after Jan Month. Step 2: Cut and paste the columns H & I to the newly inserted columns D & E.
Step 3: Now delete those newly vacated columns D & E.
Now we have the data in order. Drag and drop is a tricky one because if you don’t hold shift key you will end up with losing out the data. 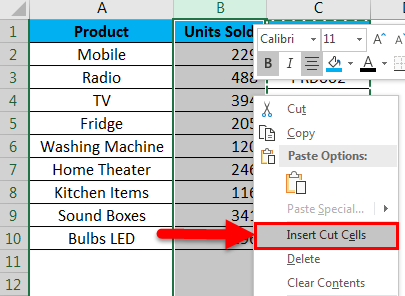 CUT & PASTE is the easiest way to do so, but we cannot simply paste the column rather we need to select the option INSERT CUT CELLS. Always hold onto the shift Key until you are ok with the desired column to move in drag and drop method in Excel. How to Convert Columns to Rows in Excel? 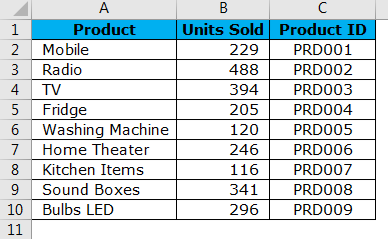 How to Compare Two Columns in Excel?